This page has information about fees and payment options for lessons, group classes, and ensembles. For summer camp fees, deadlines, and payment options please click here. 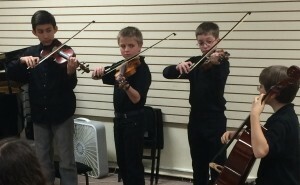 Private lessons are billed at $50 per hour ($25 for half hour, $37.50 for 45 minutes). A weekly half-hour lesson will average $100 per month. Students may choose to pay lesson fees on a monthly basis or purchase a block of lessons in advance. Shared Lesson Fees: For selected instruments, 2 or 3 people can share a lesson! Adult groups classes are $100 for a six-class session. All ensembles are billed at $150 for a 12-week semester. Students who register for more than one ensemble receive a discounted rate of $125. If members of the same household register for more than one ensemble, they each receive a discounted rate of $125. Billing: starting in January 2018 we have a new billing system! Each family will receive a monthly invoice listing charges for the prior month. It will be delivered to your inbox on the 5th of each month, and payment will be due on the 15th. Your invoices and statements will arrive via email unless you make other arrangements with us. When you receive your invoice you will find a “pay now” link that takes you to a page where you may pay by electronic check with no extra charge. You may also use the “pay now” link to make a credit card payment. There will be a $4.95 charge to help cover our expenses for this service. You may still pay by hard-copy check, also with no extra charge. Please make it out to C4A and write the student’s first and last name on the memo line. Checks may be deposited in the lobby drop box or mailed to us at 103 North Race Street, Urbana, IL 61801. You may pay in cash! Please ask your teacher to give you a receipt, and keep it for your records. You may still use Pay Pal to make a credit card payment, although we expect to phase this out in coming months. There will be a $3 convenience fee to cover our expenses for this service. We have demand for, but very limited resources for offering, need-based scholarships. If you would like to contribute to our scholarship fund please e-mail our director or make a donation using the “Donate” link on our scholarship page.